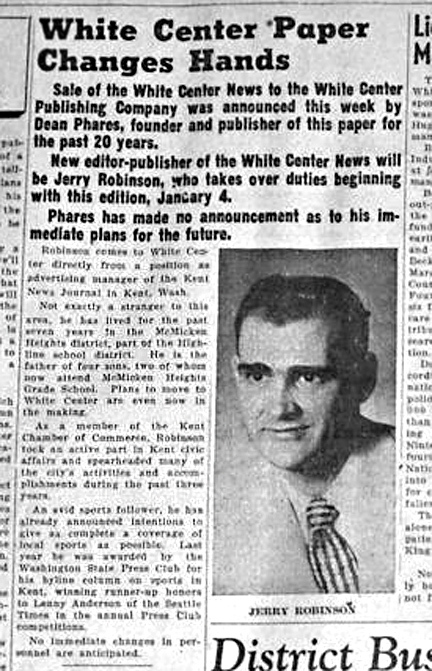 Jerry Robinson took over ownership of the White Center News on January 4th, 1952. His career in the newspaper business led to founding the Federal Way News, and eventually buying the Highline Times, West Seattle Herald and Ballard News Tribune. He remains active in the business today, winning Best Humor Columnist in Washington State two years ago. This week marks 58 years of being a newspaper owner for Jerry Robinson, Publisher of the West Seattle Herald/White Center News, Ballard News Tribune, Highline Times, Des Moines News, SeaTac News, and FederalWayNews.net. He looked back at his career and offered his thoughts on this anniversary. "Twenty years ago after thirty eight years of day to day newspapering we sold the papers and Elsbeth and I bought a winter home in Palm Desert and I concentrated on golf. It was great. For about two years... and then our buyers sold out to the Seattle Times. That arrangement fizzled and the Times bagged it. They closed the papers (all except the White Center News and West Seattle Herald) and kept the commercial printing operation in Tukwila called Rotary Offset we had started in the 70s. We immediately restarted the other weekly papers the next week. With my golf game getting worse each day I told Elsbeth I wanted to sell our wonderful winter place and go back to work. She said okay and I learned a great lesson. We plunged into the paper biz nearly full time again and I love it. I found that the best sense of personal value is to be useful to others. To be able to offer something of value. I love my life each day. I am busy writing and taking pictures. My days fly by, I sleep like a baby at least 8 hours a night. My first job with weekly papers was with the paper in Kent while living in the Highline district. I was a rank beginner but anxious to please so I worked six days a week and immersed myself in the business activities. I had high energy and worked at creating advertisng ideas. I loved it and tried to make a name for myself, and the paper owner and eventually got noticed and was offered a chance to operate the paper in White Center. Through a special arrangement with the owner I purchased the paper and took over in 1952. It was the beginning of great growth and the community grew dramatically. During the first years we owned the paper, five grocery chain stores, three furniture stores, three drug stores, four appliance stores, four women's shops, three shoe stores plus four new restaurants opened up . Our staff created four Seafair floats and we won the Grand Sweepstakes award in 1958. White Center was a vibrant place. Then Burien came alive and White Center started declining during the 1960's. So we joined with the paper in Burien and started the first offset newspaper printing plant in the nation in Burien and shortly after moved the plant to White Center. We started the Federal Way News in 1954 and purchased the Highline Times in 1975. The West Seattle Herald was founded in 1923 and in 1975 we purchased the Herald from the Dunn family and have operated it ever since. We purchased the Ballard News Tribune in the 1990's and operate it today. Eventually we grew and moved the presses and printing plant to Tukwila forming Rotary Offset, a commercial printing company. The Seattle Times later purchased that company and moved it to Kent where it remains and has become one of the largest shops in the Northwest. We've been through many changes in the communities we serve and I'm sure many more are coming. But I'm convinced of one thing. Communities like ours need a newspaper (whether it's printed or electronic) to provide the record of events and represent the community. I've loved being a newspaper man most of my adult life (I did work at Boeing during WWII), and it's been an honor to bring you the news, and introduce you to the great people who live here.